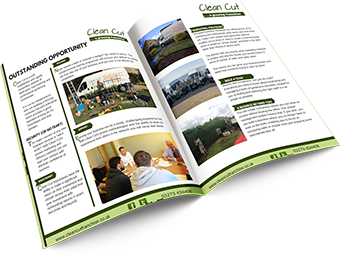 You are signing up to receive weekly newsletters from Clean Cut Gardening. We will never sell on your information to third parties, and your details are kept private. Contact us to become the next successful candidate. Born in Zimbabwe I have always loved the outdoors and have a big passion for wildlife. Since coming to the UK with my English mother for political reasons I found myself working nights at a hotel just to pay the bills. It was terrible! I was earning very little money and had no time for my wife or children as I was asleep whilst they were awake. I had to make a change. It was then that I found the Clean Cut model and it was like love at first sight! It is a business that combines my love of the outdoors with my desire to earn good money and spend more time with my family perfectly. 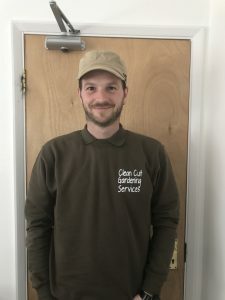 In addition Simon, Gary, Dave, Craig and the team are all lovely people and it is pleasure to work with them and indeed all of the other Clean Cut franchisees, I feel like I have been adopted by one big happy successful family and its great. In my first week I made more money than I did in a month at the hotel! If you are looking for a life changing opportunity look no further Clean Cut really is a good as it sounds! I became a Clean Cut franchisee in March 2014 and I simply hit the ground running. Previously I was head green keeper at my local golf course. But after years of hard work and dedication I began to feel unappreciated and under – valued so I decided it was time to do something drastic and that’s when I came across the Clean Cut opportunity. Although I was slightly nervous about running my own business I soon realised with the Clean Cut back office support network behind me I would never feel alone, and any worries I had were short lived. Even the incoming calls are answered for me so I don’t have to down tools and race back to the van, scrabbling for a pen and paper to write the contact’s details down. I would recommend to anyone who wants to go into business for themselves, who likes the outdoor life and being their own boss to get in touch with Clean Cut. If you’re anything like me you won’t regret the decision. I’d spent the last 10 years working in a job which I found more and more depressing every day, working until midnight and starting at 4am just wasn’t working for me or my family anymore. The money wasn’t great either. I was made aware of Simon Studd and clean cut gardening by a friend so thought I’d find out a little more. I was obviously sceptical about handing over a large amount of money, as anyone would be, but a few meetings down the line and a chat with the existing franchisee’s soon put my mind at ease. Being that I always wanted to be successfully self employed, and my love for gardening I signed on the dotted line. I am already well on the way to exceeding my previous wage and am sure to increase that dramatically over the next few years. I also have the quality of life I’ve missed for so many years and look forward to many more and the running and development of my own successful business. I first looked at the Clean Cut Franchise opportunity in 2014 but was not ready to make the investment and decided not to move forward. Four years later, I decided to watch the latest Clean Cut webinar and was reminded of what a great opportunity it was and was impressed by the success stories of the existing franchisees. I booked into see Simon and Gary and was once again made to feel welcome and was impressed by the sincerity from them both and the obvious desire they both had to ensure my success. It’s lovely to be working in an environment where they care as much about my success as I do, and even though I am making an investment it does not feel like a risk at all. Whats more having met some of the other franchisees it is obvious they are all successful and growing fantastic businesses. For the last four years I have been working 14 hour days on a country estate rain or shine for significantly less money than I am going to earn with Clean Cut. So, the prospect of working fewer hours and having more time to spend with my family is very exciting. If only I had said yes four years ago!!! Copyright © Clean Cut Gardening Services 2011-2014. All Rights Reserved. Sign up for our weekly newsletter, featuring exclusive business advice from Clean Cut, offers and news about upcoming events.